On March 18, 2017 I celebrated my 10th anniversary as the senior pastor of Fairview Baptist Church. I have been in the ministry for 42 years and have served as pastor for 35 years. My wife Virginia and I have been married for 41 years and have one daughter Lindsey and her husband Levi Overton who live in Double Springs AL. They have three children Emma 10, Kale 6, and Carter 6. My main responsibility here is to preach God’s word 3 times a week. I lead in ministry to the church family, as well as ministry to the community and to the uttermost parts of the earth. I believe that the senior pastor should lead by example and I try never to ask people to do anything that he is not involved in. God has called me to be a servant leader. We are trying to develop every member to follow the example of Christ. God’s goal for every beliver is they take on the character of Christ. I have been serving at Fairview Baptist as the Associate Pastor since December, 2016. My main focus is ministering to the 18yrs old and younger crowd and seeing them grow in their faith. I grew up in Loretto, TN and spent most of my time either with family, friends, sports, or outdoor activities. It wasn't until the age of 14 that I had my first true encounter with Christ and confessed Him as Lord of my life. Not long after that, God grew my passion for ministering to other teenagers, and eventually called me into the Student Ministry. In May of 2005, Jennifer and I began our journey together through marriage and following God’s leading on our lives. Since then, we have lived and ministered in the cities of Chicago, Indianapolis, Birmingham, and Orlando. We have also welcomed two beautiful children into our journey (Braddock and Ensley). Now we find ourselves in Athens, AL and we absolutely love the incredible community we have found here and the connections we have built with the Fairview Family. Carter Whiteside has been part of the Fairview family since 1981, when he and his family moved to the East Limestone community. From 1981 to 2001, Carter served as Interim Music Minister on 3 different occasions before feeling God’s call to serve as Music Minister/Worship Leader on a regular basis in 2001. Since then, Carter has led our sanctuary music and adult choir in a style which blends traditional hymns with more contemporary songs and instrumentation. He reminds us that true worship must be God- centered and requires participation. Carter is a native of New Albany, MS, and a graduate of Mississippi State University. He was raised in a Christian family and accepted Jesus as his Savior at the age of 9. 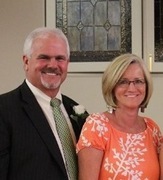 Carter is married to Barbara Waddle Whiteside, a teacher at Creekside Elementary School. They have 3 adult children and 10 grandchildren. Their grandchildren keep them very busy. They enjoy traveling for business, pleasure, and missions. These interests have taken them to most of the United States as well as seven foreign countries. Carter is Bi-Vocational. He has provided insurance and financial services through New York Life Insurance Company since 1984. Maurice has been at Fairview Baptist Church for 53 years and Janie for 75 years, where they have served 13 of those years as custodians. Janie loves music and is also the church organist. 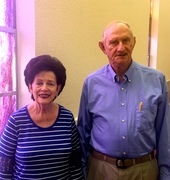 Maurice worked at Goodyear in Decatur for 37 years before his retirement and Janie drove a school bus for 30 years for Limestone County Schools. They have one son, Alvie Bates.